Eschew the tourist crowds and head to Vintgar Gorge (Soteska Vintgar) and Tromostovje. Explore Ljubljana's surroundings by going to Skocjan Caves (in Divaca), Predjama Castle (in Postojna) and Bled (Bled Castle (Blejski Grad) & Lake Bled). The adventure continues: take a stroll through Ljubljana Old Town, take in the views from Dragon Bridge (Zmajski Most), stroll through Tivoli Park, and glide peacefully along the water with some of the best stand-up paddleboarding in the area. To find traveler tips, ratings, more things to do, and other tourist information, read our Ljubljana trip itinerery planner. If you are flying in from Italy, the closest major airport is Ljubljana Jože Pučnik Airport. Expect a daytime high around 24°C in September, and nighttime lows around 10°C. Wrap up your sightseeing on the 10th (Sat) early enough to fly to Sarajevo. Start off your visit on the 11th (Sun): indulge in some culinary diversions at a local gastronomic tour, get engrossed in the history at Gallery 11/07/95, then get a taste of the local shopping with Isfahan Gallery, and finally contemplate the long history of Bascarsija. Here are some ideas for day two: don't miss a visit to Vijećnica, then look for gifts at W Market Epicerie Fine, and then make a trip to Sarajevo War Tunnel. 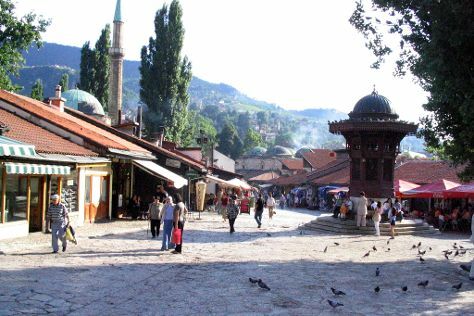 To find photos, maps, traveler tips, and tourist information, you can read our Sarajevo trip itinerery planner. Traveling by flight from Ljubljana to Sarajevo takes 3 hours. Alternatively, you can drive; or do a combination of bus and train. Traveling from Ljubljana in September, expect nights in Sarajevo to be about the same, around 12°C, while days are a bit warmer, around 28°C. Wrap up your sightseeing on the 12th (Mon) to allow time to drive to Split. Eschew the tourist crowds and head to Spanjola and Dubovica. Change things up with a short trip to Trogir Historic Site in Trogir (about 42 minutes away). On the 14th (Wed), spend a day of history-infused exploration at Diocletian's Palace. And it doesn't end there: steep yourself in history at Old Split, appreciate the history behind Cathedral and Bell Tower of St. Domnius, take in the awesome beauty at Marjan, and make a trip to The Peristyle of Diocletian's Palace. To see maps, where to stay, more things to do, and other tourist information, refer to the Split trip builder. Drive from Sarajevo to Split in 4 hours. Alternatively, you can take a bus; or do a combination of train and bus. Traveling from Sarajevo in September, Split is a bit warmer at night with lows of 19°C.